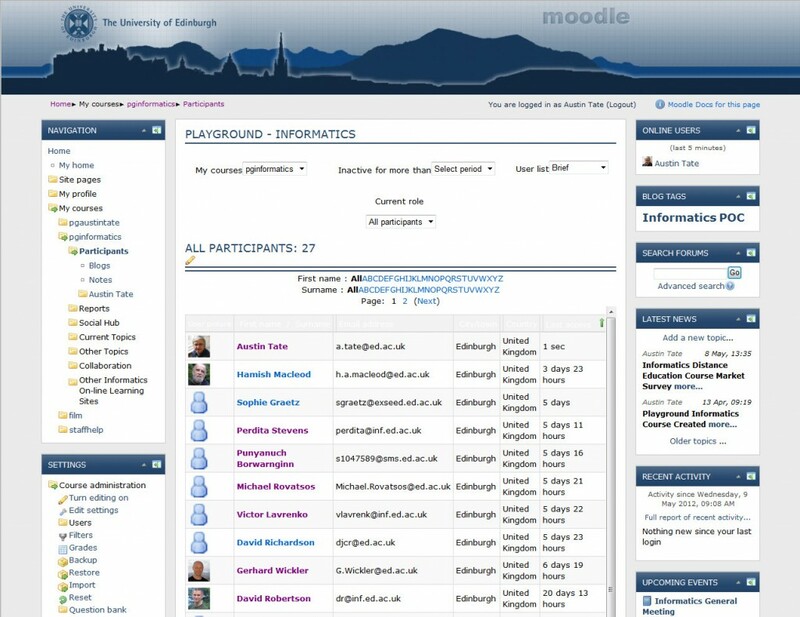 The chosen Virtual Learning Environment (VLE) for distance education delivery in the University of Edinburgh is Moodle, an open source platform. Initially it is available for use for on-line and distance educational uses at http://www.moodle.is.ed.ac.uk, but may become available for on-campus on-line course support in future. 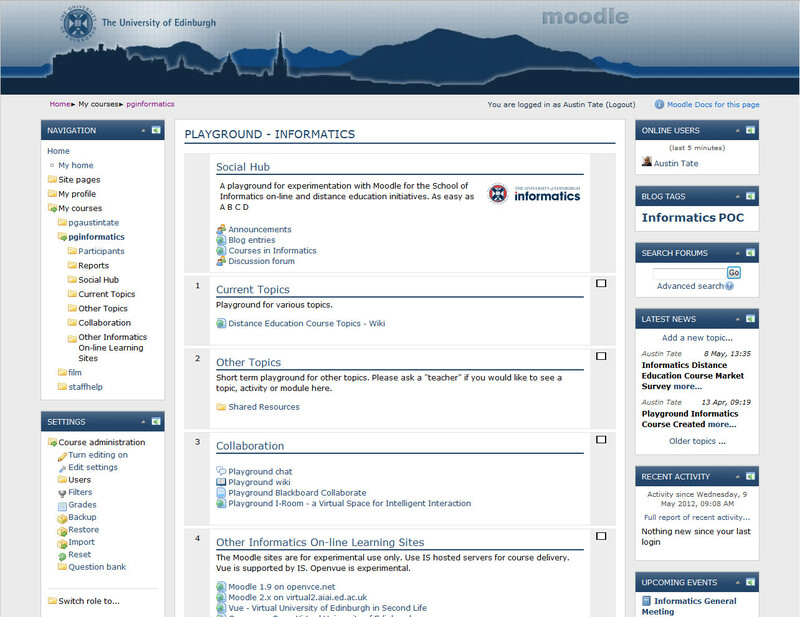 A “Playground” for use by those interested in on-line and distance learning in the School is now available on the Informatics Services Moodle service. Login is via EASE and your usual University Unique User Name, but you must be added manually to the Moodle access list while the service is still under development. You can request that via a.tate@ed.ac.uk or is-helpline@ed.ac.uk by giving your UUN, normal e-mail address, preferred display name, and saying you wish to be added in the “student” role on the course “Playground – Informatics” (pginformatics). If you wish to experiment in the role of “teacher” in the Playground please discuss that with a.tate@ed.ac.uk. For those active in distance education in the school, a personal playground or course preparation area can be made available. Regular Moodle user community events are now being organised by Information Sevices, and “courses” for mutual support are available for staff and students in Moodle itself. This entry was posted in Moodle and tagged Moodle. Bookmark the permalink. We have been running a Moodle service as part of the OpenVCE.net virtual collaboration envioronment programme for a few years. We recently updated that to version 2.2 and 2.3 for tests of external tool links, and use of the SLoodle module to link Moodle to virtual worlds such as Second Life and OpenSim. You can see some of my experiments on these in my MSc in e-Learning blogs on this topic at http://holyroodpark.net/search/index.php?weblog=moodle&owner=261.